Students have mixed reactions to Dickinson’s new plastic lids, part of their “strawless” campaign. 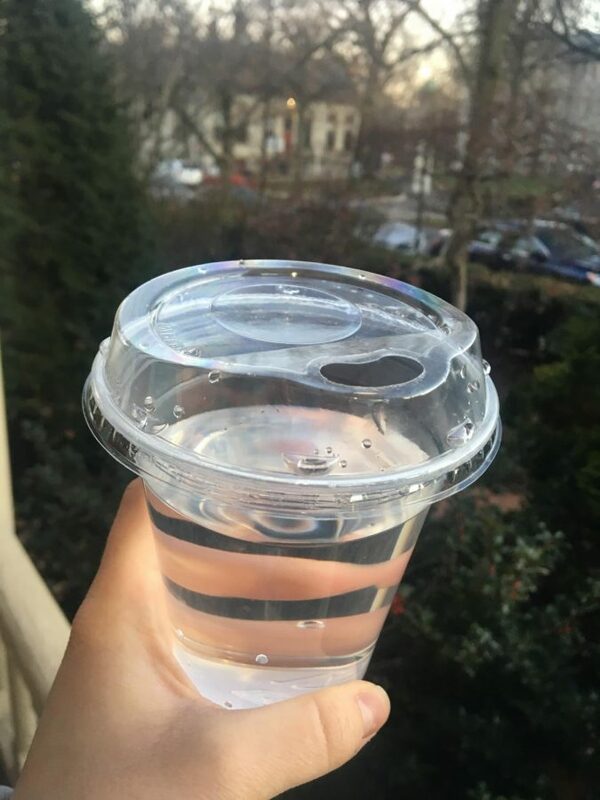 On Monday, Dickinson went completely strawless and Dining Services debuted their new plastic lid. Students will be given this lid when they order any beverage to-go from a campus dining location. The design of the lid is similar to any standard coffee lid, like those used by Starbucks or Dunkin’ Donuts. Now that the lid is finally here students have mixed reactions. “I can’t say I am the biggest fan,” said Jen Ailey ’19. Ailey said when she found out about the plastic lids earlier in the semester, she decided to order her own stainless-steel straws from Amazon. She said she will use her straws instead of the new lid when drinking her coffee and smoothies. “I was under the impression the lids were going to be paper because that seems more sustainable than just using more plastic,” said Ailey. “Both the old lid and the new lid have the same amount of plastic and weigh in at 3 grams each… The new lid is recyclable and there is less plastic since the straw will not be offered. We are eliminating from our waterways and marine life, a source of one of the more challenging plastic contamination issues,” said Director of Dining Services Errol Huffman. Huffman also mentioned that Dickinson Dining Services will no longer provide plastic straws behind the counter, as they did earlier in the semester. However, paper straws will be available for those who have received certain mouth surgeries and those who have documented medical conditions and receive accommodations to use the straws. The lids may be harder to drink from, some students report. “I tried to get an orange juice with ice and the ice kept getting stuck in the opening of the lid… it was really frustrating,” said Graham Klimley ’19. Dickinson’s strawless campaign was created for the college to be more environmentally friendly and followed a national trend after a YouTube video showing a turtle with a straw stuck in its nose went viral. However, students have some concerns about how sustainable the lids really are. Some students like the lids. “I like the new lids, even though they are definitely a little bit harder to drink from,” said Rose Lang Zalph ’21.